What Will I Learn in My Online Master’s in Finance Program? Do I Need to Take the GRE to Enroll in an Online Master’s in Finance Program? Students who are interested business organization and planning may be drawn to finance, which centers on making the best use of a company’s assets. The nature of this work makes it applicable to all sectors of business — meaning that finance jobs are always in demand. Many positions in the field rank as some of the highest paying in the business world, and advanced degrees in finance are extremely popular among working professionals. As a result, many schools offer online master’s in finance degrees that allow students to maintain their careers while simultaneously gaining the education necessary to advance in them. Finance and accounting both relate to managing a business’ assets, but the two fields serve different purposes. While accountants record and report a business’ financial transactions, those in finance plan how to effectively utilize and distribute the business’ assets, creating strategies to facilitate financial success. The finance department has a more active role in shaping a business’ plans for the future, all steered by the company’s chief financial officer. Finance can include areas such as investment banking, portfolio management, financial analysis, and financial advising. While they differ in their methods and practices, these specializations all involve utilizing assets in the most effective way in order to increase profits. 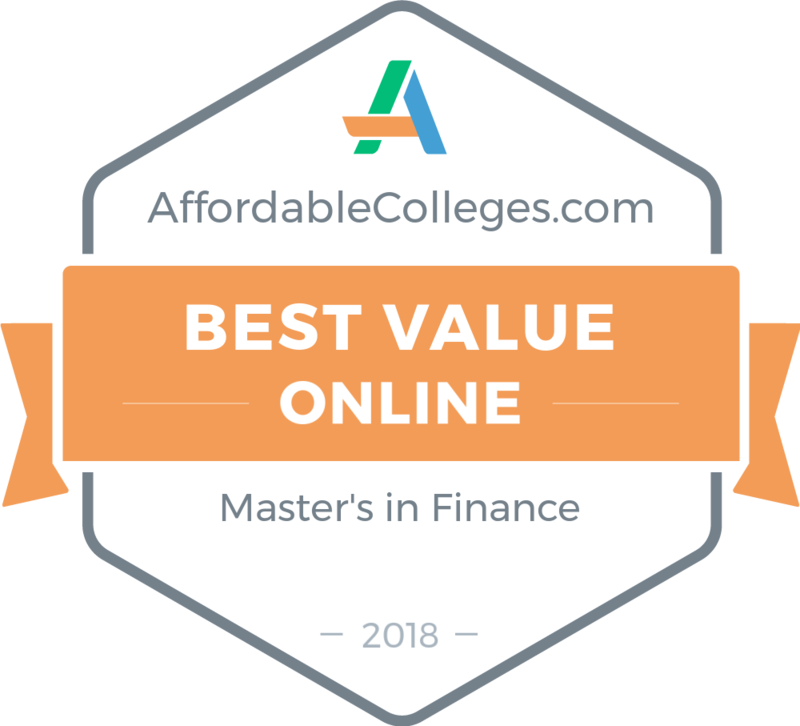 For those interested in an affordable online masters in finance program, these schools boast top-notch education along with reasonable tuition rates. The colleges on this list all offer convenient, flexible online education, minimizing students’ time in school and maximizing their potential for professional success. Time to Complete Two years is typical for full-time students. Credit Hours 18 credit hours per year is average for full-time students. Additional Considerations Most programs require prior coursework in college math, accounting, business statistics, and/or economics. With accredited undergraduate and graduate degrees in a wide variety of fields, CSU's Global Campus has a mission to enhance the life of citizens from Colorado and around the world through excellent academic programs. Students can earn an online master's finance degree from CSU to develop their leadership, operational finance, and technology skills, becoming a more attractive business candidate in the process. Many students who earn a master's degree in finance at CSU pursue careers as financial advisors or managers. CSU offers students a flexible schedule, perfect for those who want to earn an online master's in finance either full- or part-time. And because CSU's Global Campus only serves online students, all of its tools, communication, and resources are easily accessible for distance learners -- so no students will miss anything by being remote. Although UHLC has not been around as long as the system's flagship campus, the school has made a name for itself as a strong academic institution. Since its creation in the early 1970s, the small state university in Texas has awarded students more than 62,000 degrees. UHCL, with a diverse student body of about 8,000 students, is located on a nature reserve and well known locally for its community focus. That emphasis extends to UHCL's online programs as well. Remote learners can earn an online master's in finance degree via UHCL's flexible MS program. The fully accredited 30-credit program uses the same full-time, experienced, PhD faculty who teach at UHCL (including CFAs and CFPs) and can be taken completely online. Classes are small for more personal teaching. Finance master's degree students at UHCL can expect to learn everything from theory to practice so that they'll be ready to hire. The program includes networking and UHCL's career services. Originally teaching only 13 students when it was founded in the late 1800s, Concordia University now serves thousands of students from a variety of backgrounds. Located just outside of Milwaukee, Wisconsin on the shore of Lake Michigan, this Lutheran university aims to instill a global perspective in its students, among other virtues. Students globally can become part of the Concordia community through its many online programs, including its master's of business administration with a focus in finance. Concordia's 39-credit, accredited online finance degree is taught by industry professionals. With electives in real estate investment, international finance, risk management, and much more, Concordia's online finance program prepares students for a variety of careers. Distance learners at Concordia can use their degree to become budget analysts, cost estimators, financial analysts, financial examiners, personal financial advisors, and more. The personalized program includes a flexible schedule and a capstone project at the end. Hobbs, New Mexico is home to University of the Southwest. USW is a small, private interdenominational Christian university that specializes in education and business. The school's mission focuses on providing superior education and guidance to its students supporting entrepreneurship and virtuousness after graduation. USW online students can earn a finance master's degree through USW in its MBA program. The Finance specialization in the USW MBA program includes courses in financial reporting, small business finance, financial planning and investment, multinational finance, and organizational design. Small business owners and entrepreneurs may be particularly drawn to USW's 36-credit program. The program can be completed in one year. Located in scenic Henniker, New Hampshire, NEC was originally created to serve military veterans returning from World War II. Maintaining its community and citizen focus, NEC has expanded its academic offerings over the years and now counts roughly 2,000 students on its NH campus and many more online. But students don't need to visit NEC's picturesque campus for a quality education -- they can earn a master's finance degree online. Remote learners can earn an online finance master's degree through NEC's banking & financial management program. The 36-credit financial master's degree includes courses in capital strategy analysis, mergers, and acquisitions, and leadership. Students can complete the accredited program in fewer than two years and work collaboratively completely online. In addition to a thorough curriculum, all NEC finance classes have facilitators to answer any question and assure students are learning optimally. From its humble beginnings as a 19th century boarding school for Midwestern women, USM has kept its focus on individual learning through small class sizes. The faculty-to-student ratio at USM's Leavenworth, Kansas campus is 11:1. The Catholic liberal arts college maintains that intimate teaching relationship with its online programs as well. Students for the online master's degree in finance at USM can expect to be part of this tight community and have full access to the Online Student Support Team. Online finance master's degree students will earn an MBA with a concentration in finance. The program can be completed in as little as one year and consists of concise and efficient eight-week courses. Financial decisions, financial and capital issues, and advanced financial topics are a few of the courses for the finance concentration. An online MBA from USM specializing in finance prepares students for careers as financial analysts, financial managers, economists, and sales managers, among others. Webster takes a global perspective to higher education. In addition to its main campus in St. Louis, Missouri, Webster University has campuses in Ghana, Greece, Thailand, and many other locations throughout the world. Webster further fulfills its mission of being a "worldwide institution" for global citizenship through its online programs. Distance learners can become part of Webster's global community through its online finance master's degree. The master's of science in finance is offered online as well as on campus. It is designed to prepare students for whatever career path they elect to follow with customized course offerings for certifications such as Chartered Financial Analyst, Certified Financial Planner, or corporate leadership positions. The accredited finance master's degree requires 37 credits in courses including advanced corporate finance, institutions, and financial markets and financial strategies. With campuses in northern Ohio and Romania and many international students, Tiffin provides students with a diverse, and inclusive and global educational opportunity. Specializing in business, arts and sciences, and criminal justice, Tiffin offers a number of undergraduate and graduate degrees on campus and online. Master's degree in finance students and other online learners have access to all of Tiffin's best services including the career development office, the graduate student services office and school's expert faculty. The master of business administration degree with a concentration in finance is an accredited online master's degree that fosters a collaborative environment with students. Tiffin notes that it uses MBA candidates' real-world experience to enhance classroom learning and provide personal support to students. With career goals ranging from real estate development, banking, and business managers, Tiffin provides students with a diverse and comprehensive education as part of its online finance master's degree. Although SNHU's flagship campus is located in the Granite State's largest city, Manchester, the overwhelming majority of students are online learners. The school aims to provide a high quality education with a professional focus and offers dozens of certificates, associate, bachelor's, and master's degrees online. SNHU provides two online master's degrees in finance; one MS concentrates in corporate finance and the other focuses on investments and securities. In addition to a rigorous curriculum with courses such as financial modeling and short-term financial management, SNHU assists online master's degree students with professional networking and personal support. Because of its specialization in online programs, distance learners can feel comfortable with the access, flexibility, and design of SNHU online master's degrees. California Lutheran University, with its flagship campus in Thousand Oaks, states its mission as educating leaders for a global society. Students interested in becoming a business, corporate, or financial leader can apply to Cal Lutheran's online master's degree in finance. The MBA in financial planning provides distance learners with a flexible schedule and is typically completed anywhere between 12 and 36 months. The 16-course program is perfect for Southern California residents with its options for on-campus learning, online learning, or a mix of the two. Cal Lutheran's online finance master's degree programs uses eight-week terms for classes. The university is seriously focused on individual learning and caps all courses at 20 students, so that every person has the optimal learning environment. In the heart of San Francisco, California's financial district, GGU has made a name for itself in the business and law sector. GGU's education focuses in the areas of business, law, finance, and taxation with the goal of preparing students to be professionals and helping professionals improve their careers. GGU's curriculum is designed for students who are working, with four out of every five students taking courses part time either on campus or online. Faculty at GGU are often industry experts with experience both inside and out of the classroom. Students interested in pursuing an online master's degree in finance can enroll in GGU's online MBA with a concentration in finance. Teaching practical and theoretical financial concepts, GGU uses their multimedia online eLearning center to cater to distance learners and San Francisco locals in the same way. Northeastern has a strong focus on professional and career-focused education. The large, private university typically sees undergraduate students enroll for 10 semesters over five years with two semesters devoted to internships or co-ops. When students leave the downtown Boston, Massachusetts campus, they're ready for the job market. This quality flows into Northeastern's online programs as well. The online finance master's degree program at Northeastern doesn't just teach students about banking and securities analysis, there is also a heavy focus on communication skills, professional marketability, and networking. Northeastern notes its emphasis on both "direct experience" and "applied research" in the online finance master's degree. The program is designed for distance learners who want careers as CFOs, consultants, risk managers, private wealth managers, statistical analysts, and investment bankers, among many other paths in several business sectors. Investments: This course will include an introductory survey of how to understand and utilize best practices in investing. Common topics include portfolio theory, mutual funds, security trading, investment banking, and short-term and long-term investments. Managerial Economics: This course is often one of the first you’ll take in your master’s in finance program and builds on basic economic theories to help students understand, analyze, and make decisions as managers. International Finance: A course in international finance explores how markets and best practices for managerial finance can differ around the world. Students also study how different financial markets operate in a variety of different countries. Financial Markets: This course includes a look at how financial markets and institutions are operated, regulated, and structured. You may also study how these markets and institutions impact the economy at large. Corporate Finance: Many online finance master’s degree programs have a corporate finance concentration, which include required coursework that prepares graduates to pursue a career in corporate financial management. Investment Finance: This concentration is designed for students who want to pursue careers in investment management and advising. Required coursework emphasizes portfolio management and securities. Healthcare Administration: This concentration prepares students to work on the financial side of the healthcare industry. Coursework will cover topics such as how the healthcare system operates, as well as best practices and the particulars of finance within the industry. Accounting: This concentration is designed for students that are interested in becoming Certified Public Accountants (CPAs). You’ll enroll in coursework coursework designed that prepares you to sit for the CPA exam upon graduation. A master’s degree in finance is a versatile program that can lead to a number of different finance-related career paths. Graduates can work at banks, insurance companies and other corporations as financial analysts and managers. They may also pursue careers in the public sector as financial examiners or work directly with the public as personal financial advisors. These careers require strong math and analytical skills and reward those who are good communicators, confident decision-makers, and have an eye for detail. These professionals work in an office environment anywhere from 40 to 80 hours per week, especially early on in their careers. Financial analysts are experts at parsing financial data. They collect, monitor and analyze this data and offer their recommendations to their managers. A bachelor’s degree is all you’ll need to earn an entry-level financial analyst role, but a master’s in finance will be a major asset in your job hunt. A master’s degree is often required for promotions to more senior financial analyst roles as well. Financial advisors work with private clients and offer guidance on how to manage and invest their finances. Roughly half of financial advisors are self-employed, with the rest typically working in financial institutions or insurance companies. While you don’t need to earn a master’s degree to become a financial advisor, it can be particularly useful if you specialize your studies around a certain area of finance. Financial managers handle all of the financial aspects of an organization. They prepare and analyze financial statements and forecasts, monitor markets and regulations, and oversee employees. Financial managers with a master’s degree typically have a higher earnings potential. Financial examiners are responsible for ensuring that financial institutions and transactions stay within legal bounds. They are typically employed at private institutions like banks and insurance companies, as well as in federal and state governments. Financial examiners with a master’s degree can pursue a variety of senior roles within the field. Chartered Financial Analyst (CFA): One of the most common certifications pursued by master’s in finance students, CFAs have a deep understanding of investment analysis. To become a CFA, you must pass three levels of exams. The difficulty and time commitment required to become a CFA make this a particularly attractive designation for employers of financial analysts. Certified Financial Planner (CFP): CFP certification is seen as a requirement for financial planning professionals. CFPs must pass a rigorous, 10-hour exam that emphasizes upholding ethical standards. CFPs also to be more attractive candidates to employers and command higher salaries on average. Certified Public Accountant (CPA): This licensure program is designed specifically for accountants. In fact, some states require that all accountants must be CPAs. While specific eligibility requirements vary by state, all CPAs must pass a difficult 16-hour exam. CPAs typically earn 10-15% more than their non-CPA counterparts. While an undergraduate is all you’ll need to obtain many entry-level roles in finance, earning a master’s degree will open more doors for you. Many firms will offer higher salaries to those with a master’s degree, and some have it as a requirement for those seeking senior-level positions. In fact, undergraduate who majored in business or a related field experience a 40% boost in earnings if they obtain a master’s degree. Many career paths that require a master’s in finance also lead to licensure and certification programs. These programs involve challenging exams, and many master’s in finance degrees tailor their curriculum around helping students pass these tests. When it comes to determining the salary of a master’s in finance graduate location is an important factor. Some states have higher costs of living, which means that a high salary may not lead to the exact standard of living that you might expect. There are also certain regions of the country where many large financial organizations are headquartered. These areas regularly have a demand for new hires and tend to offer the highest salaries. The table below shows the states with the highest annual median salary for financial analysts. Many, but not all, master’s in finance programs require that applicants take either the Graduate Records Examinations (GRE) or Graduate Management Admission Test (GMAT). Requirements vary from school to school, with some only accepting one of these tests and others accepting both while having a preference for one over the other. The GRE is a more general test, and is required by a wide variety of graduate programs. Both tests include questions on a variety of subjects, with the GRE emphasizing vocabulary and style and the GMAT focusing on mathematics. You should expect to spend one to six months studying regularly before taking either the GRE or GMAT. Colleges use standardized tests for several reasons. They can be used to help assess how ready an applicant is to take on graduate-level work. They’re also helpful for measuring how candidates from a variety of backgrounds compare to one another using one standard format. Schools often use a holistic approach to evaluating applications and don’t always have a minimum acceptable score. Therefore, failing to earn a perfect score doesn’t preclude you from getting into a master’s in finance program. That said, a strong GRE or GMAT score will make you a more attractive candidate and will help increase your chances of receiving merit-based scholarships. When you are searching for online master’s in finance programs, be sure to check a school’s accreditation status. Accreditation is a process that colleges go through to ensure that they meet certain academic standards. Most colleges in the U.S. have regional accreditation through agencies like the MSA, NEASC, NCA, NAC, and SACS. Others are accredited nationally through agencies like the DETC, ACICS, and ACCSC. Schools with regional accreditation tend to be more prestigious than those with national accreditation. These schools are better recognized and have higher academic standards and often are more expensive to attend. Business schools can also be accredited through organizations like the Association to Advance Collegiate Schools of Business, the Accreditation Council for Business Schools and Programs, and the International Assembly for Collegiate Business Education. Accreditation by one of these agencies offers even more assurance on a discipline-level that a program has high academic standards. This scholarship is open to women enrolled in MBA programs that host a C200 reachout. Eligibility Requirements: Demonstrated leadership and entrepreneurial qualities, as well as a commitment to giving back, particularly to support other women. This scholarship is open to hispanic or latino students with U.S. citizenship or permanent residency. Eligibility Requirements: Student must have a minimum cumulative GPA of 3.0 and be members of Prospanica. Students must also be enrolled or planning to enroll in a graduate program accredited by the AACSB. 3 different scholarships Intended for students who plan to pursue a career in state or local government finance. One scholarship is specifically for minority students. Eligibility Requirements: Currently enrolled students with citizenship or permanent residency in the United States. Scholarship for African-American or African students pursuing a degree in accounting, business, or finance. Eligibility Requirements: Full-time students or accepted into a graduate program with active membership in NABA. Minimum overall GPA of 3.3 and minimum major GPA of 3.5. Fellowship program for MBA students of color. In addition to award, the Toigo foundation offers fellows career development, training, and networking opportunities. Eligibility Requirements: Must be applying or accepted to an MBA or master’s in finance program. Open to students of color with U.S. citizenship or permanent residency. Fellowship program for immigrants or children of immigrants pursuing a graduate degree in the United States. Eligibility Requirements: Open to students planning to enroll full-time who are 30 years old or under at the time of the application deadline. Students must be first generation U.S. citizens.